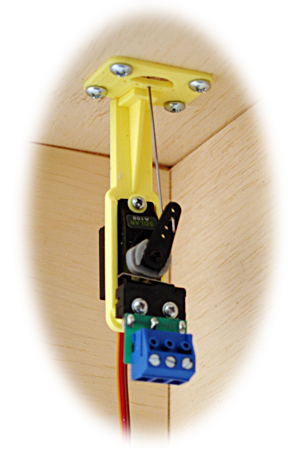 Our under-table style servo mounts let you install a 9 gram sized servo directly below the turnout throw rod. A stiff wire moves the turnout through a 3/8″ or larger hole in the track bed just like other popular switch machines. The installation is entirely hidden. Mounting pads are small allowing close and compact installations. Our dirt clearing design prevents ballast and scenic materials from accumulating and fouling the mechanism. Our electrified version of the mount adds a 5 amp SPDT cam-operated micro-switch to the mount, useful to power frogs, operate signals, or provide system feedback. The switch terminals can accept up to #14 wire and can be easily removed from the servo mount to help simplify connecting the wiring! Note that our recently updated design (not shown) has reduced the height of the mount to just 2″. The new electrified design is no taller, with the switch mountable to the left or right. For those that need multiple contacts, dual switches can now be installed for DPDT operation! 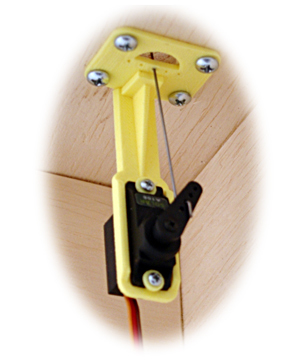 Check out our Servo Well Mount for simple installing of a hidden mounting from above the table. No bending over! Order any of our mounts individually or in a discounted 4 pack. Important Note: Any servo motor MUST be operated by an electronic control signal (DC alone won’t do it). Servos can be easily and precisely controlled with our Servo Control Bases. The mounts will work with servos controlled by Arduinos, Tam Valley Depot systems, Iowa Scaled Engineering equipment, Team Digital, and others. Legal stuff: Switching version of this product contains chemicals known to the state of California to cause cancer (lead). Unused or retired products should be recycled properly or may be returned to Berrett Hill for disposal in accordance with RoHS standards.